Today, we have another Steepler on board for 5 Questions with a member of the 2012 London Olympic Team. He's been competing at the top level of the US ranks since 2008, but this is his biggest accomplishment to date. Read on to hear about his "necessity" year. Kyle Alcorn made his first mark in 2004 with a win in the steeple at US Juniors. He would later go on to win the NCAA Championship in 2008 and would make the Berlin World Championship team in 2009. Last year, he would finish third at the USATF Championships, but didn't have the standard to run in Daegu. This year would be different. Alcorn hit the Olympic A Standard with time to spare in a strong personal best time of 8:20.86 at Oxy in May. This would set him up for his performance at the trials, where he would end up flat out on the track with a ticket to London in his pocket. 1. Writing About Running: Congrats on making the 2012 London Olympic Team. 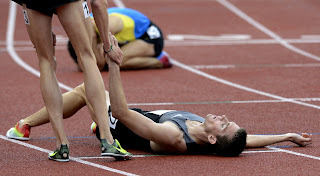 You looked like you were in severe pain after the finish of the Steeple Final. How bad did you want to make the team? Kyle Alcorn: Going into this Olympic trials failure was not an option. I knew that this was going to be a tough race and was willing to push myself as hard as I needed to make sure I would be top 3. This year was all or nothing for me, and fortunately it paid off for me. 2. Writing About Running: With six guys going into the steeple final with the Olympic A Standard, what was your strategy? 3. Writing About Running: You made the Berlin World team in 2009. How much will that experience prepare you for London? Kyle Alcorn: I think the only thing that will be helpful from that experience is learning to warm up a little earlier to allow for extra time to go through the call rooms to get on the track. I think that everything else will be amplified on this Olympic stage compared to the World Championship stage. 4. Writing About Running: What are your racing plans before and after the Olympics? 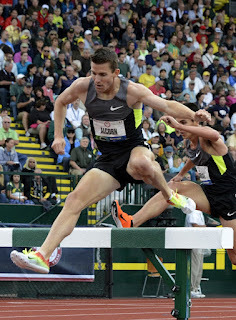 Kyle Alcorn: Right now I am planing on running two races prior to the Olympics. I am planning on racing a steeple in Lucern on the 17th and a mile in Dublin on the 25th. As for after the Olympics nothing is planned yet. 5. Writing About Running: Coming off an NCAA Championship in '08, it had to be a little bit of a let down not making the team. Can you summarize your last four years leading back to where you are today? Kyle Alcorn: There has been some changes over the last four years. I first moved back to my home town for about 1.5 years right out of college so that my wife could finish up grad school. This was tough on training since my coach Louie Quintana lived in Tempe. So in February of 2010 I moved back to Tempe to be trained by Louie face to face. I have had my ups and downs over the last four years but have managed to finish 3rd in 3 of the last 4 US Championships. I think looking at where I am now compared to where I was at the trials in 2008, I have gained a lot of experience and also confidence at racing on this level. In 2008 making the Olympic team would have just been a huge cherry on top, this year it was a necessity and I treated it as so. Is that Huling curled into a ball in that second photo? That's a powerful image - the immediate reactions of two men in which failure was no option and one came up short. And the man still on his feet is the champion. Thanks for the great write-ups Pat.